Sleep to the sound of the Big Thompson River just outside your door! 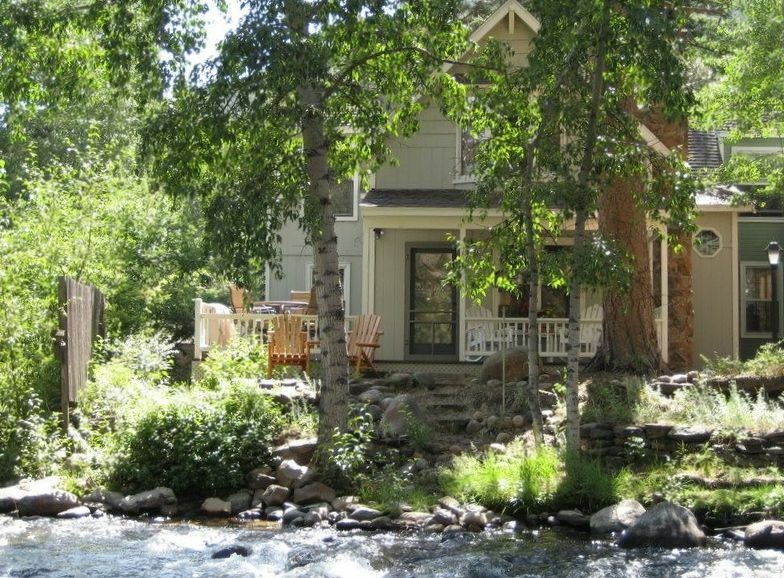 The CASA RIO VISTA is a beautifully appointed and decorated 3 bedroom, 3 1/2 bath home is located right on the Big Thompson River in a quiet private, gated community, Blue Spruce Village. The Big Thompson runs just a few feet away from the back deck. Enjoy your morning coffee or happy hour drinks listening to the rushing river from your wrap around, spacious deck. Open the windows and hear the river all day and night! We stock the river with rainbow trout every 2 weeks around late June to late Aug. The master bedroom has a king size bed, a bay window overlooking the river and a recently renovated bath. The second master has its own bath and a queen size bed. The third bedroom (a new addition to the home)can be a children's retreat....a built in bunk bed...queen on bottom and XL twin on top. This bedroom also has its own bath. Bedrooms are all upstairs. The downstairs leather sofa opens to a queen size bed. This home has it all. The kitchen is fully equipped with top quality dishware, cookware and utensils. Outside you'll find a Weber gas grill. The living area has a TV/DVR/stereo, DVD library and games. Our home also has WIFI internet access. Blue Spruce Village is approximately 5 minutes outside Estes Park and two miles from the entrance to the specular Rocky Mountain National Park. Only one quarter mile from the original entrance to the park, you can walk to a park trail that leads to beautiful Moraine Park. You won't be disappointed! 'Thank you for such lovely accommodations. Our windows and doors were always open to hear the rushing waters.' J.W., Omaha Neb. We purchased this home after visiting Blue Spruce Village for 8 years. We just love having our coffee in the cool crisp mornings while watching the kids feed the fish and chipmunks that visit the area. In July 2013 we purchased another BSV home unit #2 'Pinehenge' just a few doors down. Take a look VRBO #484296. We really strive to have all the comforts of home. We supply coffee, laundry soap, dish soap and many general essentials for cooking. Have your ever been on vacation cooking a meal that needs only 2-3 Tbs of Olive Oil? You just can't believe you have to buy a $8-10 bottle at the local grocery store for a messily 2 Tbs? ... Well we have you covered! 2 Beautiful Golf Courses Some times surprise visitors .....elk. So very happy that you had a great time. We can't wait to have you return. Beautiful house in beautiful complex literally on the Big Thompson River. Comfortable, homey, and very well- equipped. Great hearing the river, and sitting on the front porch with coffee, a book, or a glass of wine. Wildlife abounds in the area, and we saw a lot from our porch. Very close to the town center with restaurants, shopping, etc- yet has a real country feel. 2 entrances to Rocky Mountain National Park are just a few minutes away. We spent a lot of time hiking in the park. It was actually so comfortable, that we stayed IN for most of our dinners. Would recommend highly. So happy you enjoyed your stay! Glad you saw some great wildlife. Comes see us again. Home ready for us, clean and well kept. Been coming for years and always enjoy our stay there. We love that you have been a loyal guest and love staying with us! Here is to many years of memories to come. We had a wonderful stay....the house was perfect for three couples. The sound of the river through the master bedroom window was so relaxing at night. The property is beautiful and comfortable. The only drawback is the intermittent internet service. Comfortable home in a beautiful setting. The town and area is delightful and was a perfect place for a family reunion. The only drawback is the lack of dependable internet service. Casa Rio Vista was a great house! Casa Rio Vista was a great house for our vacation in Rocky Mountain National Park. It was close to the park entrance, comfortable and well furnished for our stay. It was so relaxing to sleep with the windows open at night and hear the beautiful sound of the river. It was a lovely home and I would highly recommend it! If cancel 60 days before arrival, full refund less $100 cancellation fee. If less than 60 days, no refund unless dates are resold. Cleaning fee of $150 for reservation less than 4 days.